I never used to like Korean food. Growing up in Singapore we used to have Seoul Gardens which was a rather tacky all-you-can-eat BBQ which was not that appealing. Then when I did my post-doc fellowship in Columbia U, I stayed in Fort Lee, which is pretty much a little New Jersey suburb full of Koreans. And the Korean food there was awesome! I remember when I got back to Singapore and I turned on the TV, Anthony Bourdain was on featuring my favorite tofu house with the best Sundubu Jigae in the world. I almost wept from reverse homesickness. Anyway I still get the occasional craving for Korean food. Especially when watching Korean movies – has anyone noticed that the actors are always slurping up a bowl or ramen? This is one of the reasons I try really hard not to watch Korean shows, especially the never-ending serials. 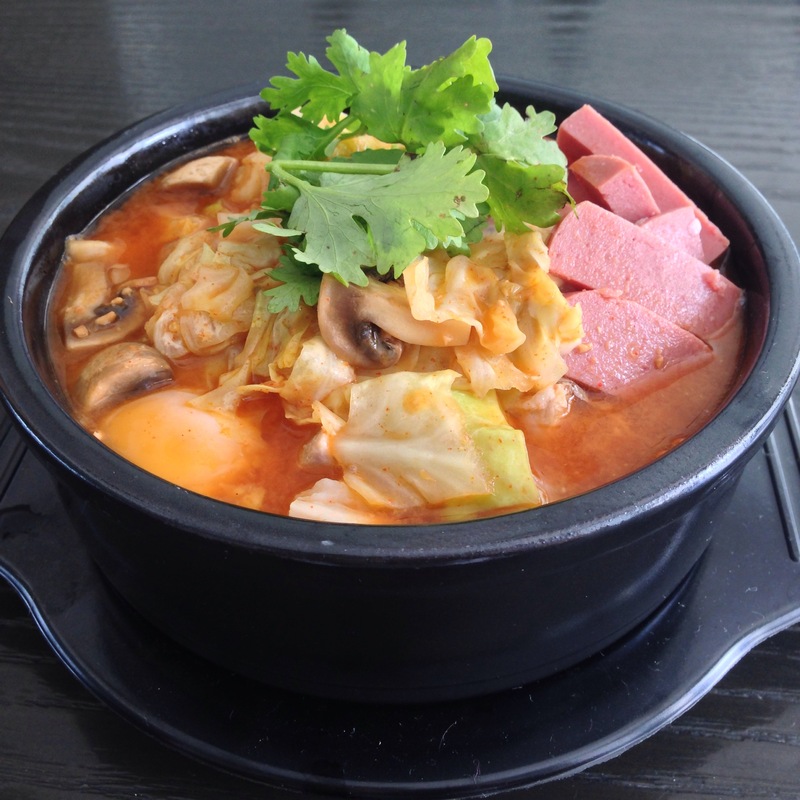 Korean Army Stew is a rather interesting post-war invention, a legacy of American influence on Korean taste buds. 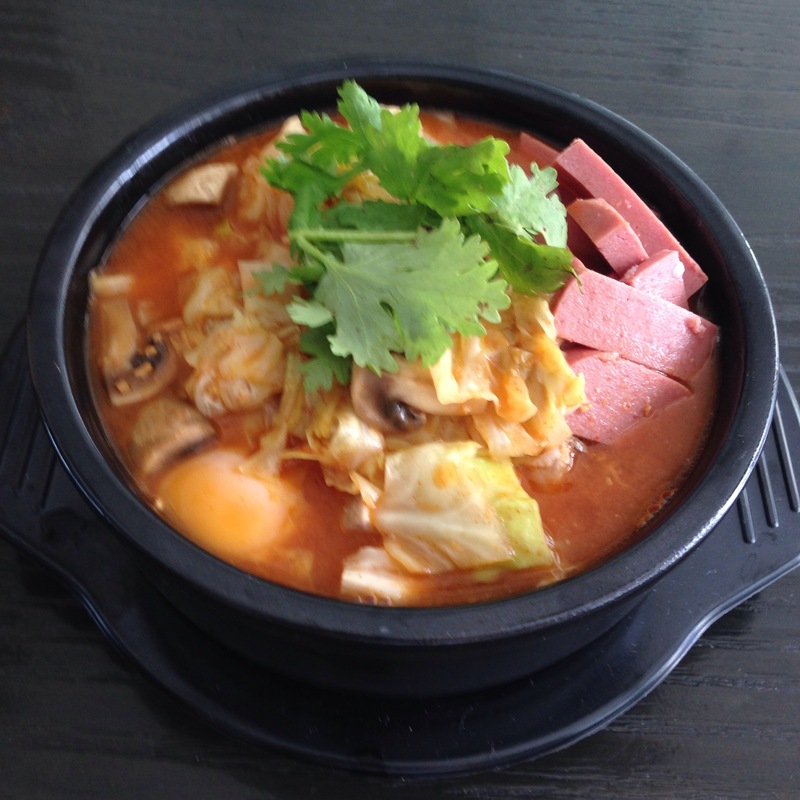 It is essentially a hearty spicy ramen stew but with surprising additions like spam, sausage, cheese and baked beans. This weird American-Korean clash of flavours actually works and I can certainly imagine many an army boy scoffing this down after a hard day of training. It was pretty easy to make this low carb as Shirataki noodles is an easy substitute for the sweet potato noodles that are traditionally used in this dish. And I ditched the baked beans which are optional in this dish anyway. Korean chilli paste and soybean paste, available at Korean specialty food stores, NTUC finest or Isetan. With a large pot, bring water, anchovies, kelp and pork belly to boils and simmer for about one hour. Then remove the pork belly and slice into smaller pieces for the stew. Drain the stock, discarding the anchovies and kelp. Take soup stock, cabbage, kimchi and mushrooms and bring to a rolling boil for about 5 minutes. Add doenjang and gochujang an stir. You may want to taste to adjust flavours. Usually no added salt is needed as the doenjang is already salty. Just as soup stock is boiling, crack an egg on top of the stew ingredients and a slice of cheese. Pour the soup stock and cabbage over the stew ingredients. I usually boil the clay pot ingredients a bit more or you can serve your guests on an induction table cooker. Serve piping hot.